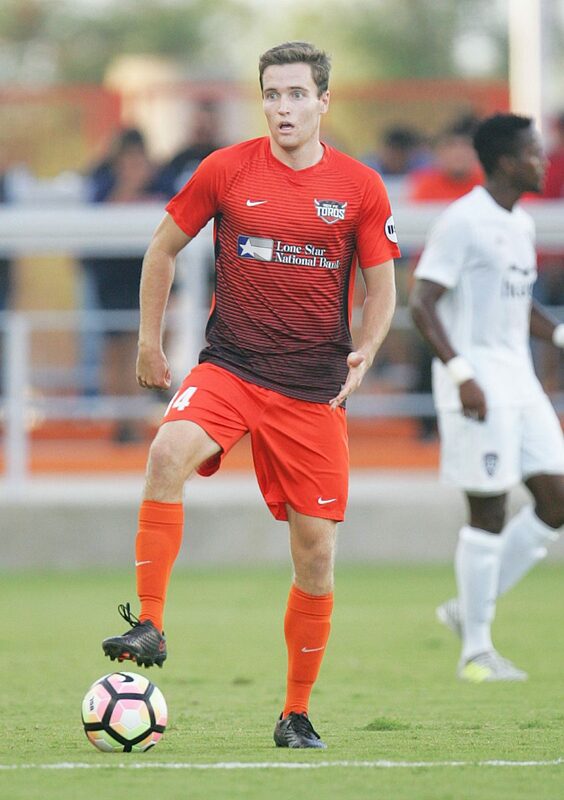 EDINBURG — On Tuesday night, just three days before the RGV FC Toros open the 2018 season, Houston Dynamo midfielder Eric Bird called RGV captain Todd Wharton to ask how his old team was looking. Wharton and Bird had been teammates for years — from the youth leagues in Virginia, to the University of Virginia, through the past two seasons with the Toros. When Bird signed with the Dynamo first team in December, Wharton found himself in a familiar position. Bird was one year ahead of Wharton at UVA, so Wharton often reached out to Bird during his senior year about ways to be a leader and approach the transition to the professional game. Three years later, Wharton is again looking to glean whatever advice he can. And he’s aiming to once again line up a second-year reunion by proving himself worthy of a shot with the Dynamo during his third campaign with the Toros. Wharton’s journey to earning a first-team contract begins in earnest at 7:30 p.m. Friday at H-E-B Park as RGV FC plays host to Saint Louis FC in the 2018 season opener. Wharton was limited to just a few minutes of action in 2016 due to a stress fracture in his foot but became one of the Toros’ fixtures last year, tying for the team lead with 31 games played. He picked up a goal and three assists last season, and he said he enters 2018 looking to become a more aggressive offensive player while still managing his responsibilities in the holding midfield. Wharton is also stepping into a role as the Toros’ captain this year. He said he’s always tried to be a leader less through his words and more through hard work, but he acknowledged that the vocal side of the game will be important on a young roster full of USL newcomers. Midfielder Jorginho James, one of just five returning regulars, sits next to Wharton in the Toros locker room and said he’s always been impressed with the mental side of his captain’s game. Wharton said helping the younger players on the team hasn’t always been easy for him. He describes himself as a fiercely competitive player who isn’t afraid to mix it up with opponents. Last season, he tied for the team lead with six yellow cards. Watching his new teammates go through drills, he’ll often see them handle situations much differently than he would. First-year RGV FC coach Gerson Echeverry said Wharton has expertly balanced intensity with intelligence. Echeverry was involved in the youth soccer scene on the East Coast before linking up with the Toros, so he said he’s known Wharton since the midfielder was 11 years old. The Toros are looking for a rebound year in 2018. After finishing second in the Western Conference at 14-7-9 during the team’s inaugural season in 2016, RGV FC stumbled to a 9-15-8 record and an 11th-place finish in the Western Conference last year.